Bernard André, O.E.S.A. (1450–1522), also known as Andreas, was a French Augustinian friar and poet, who was a noted chronicler of the reign of Henry VII of England, and poet laureate. A native of Toulouse, André was tutor to Prince Arthur of England, and probably had a share in the education of the future King Henry VIII. He was also a tutor at Oxford, and seems to have been blind. His writings are mostly in Latin, and are typical of the contemporary Renaissance, in thought and diction. His Historia Henrici Septimi was edited (1858) by James Gairdner, who says of André's chronicle of events in the Cornish Rebellion of 1497 that it is valuable "only as one of the very few sources of contemporary information in a particularly obscure period". Bernard André, The Life of Henry VII, translated and introduced by Daniel Hobbins (New York: Italica Press, 2011). Gairdner, J. (1885–1900). "Andreas, Bernard" . Dictionary of National Biography. London: Smith, Elder & Co.
Gardiner and Mullinger, Introduction to the Study of English History (4th ed., 1903), 303, 304. Eadmer or Edmer was an English historian, theologian, and ecclesiastic. He is known for being a contemporary biographer of his archbishop and companion, Saint Anselm, in his Vita Anselmi, and for his Historia novorum in Anglia, which presents the public face of Anselm. Eadmer's history is written to support the primacy of Canterbury over York, a central concern for Anselm. Richard de la Pole was a pretender to the English crown. 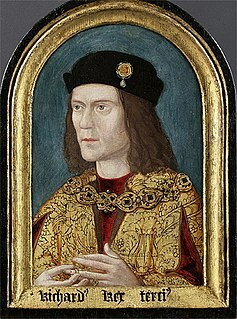 Commonly nicknamed "White Rose", he was the last Yorkist claimant to actively and openly seek the crown of England. He lived in exile after many of his relatives were executed, becoming allied with Louis XII of France in the War of the League of Cambrai. 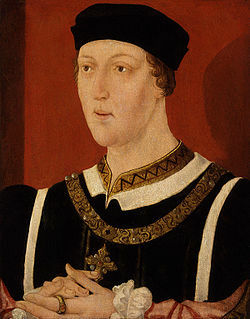 Louis saw him as a more favourable ally and prospect for an English king than Henry VIII. William Worsley (1435?−1499), was a dean of St. Paul's cathedral. A Short English Chronicle is a chronicle produced in England in the first half of the 15th century. It is currently held in Lambeth Palace Library, and although it begins its coverage in 1189, its content is thin until it reaches 1422. It covers the years from then until 1464 in greater depth, ending with the marriage of the Yorkist King Edward IV to Elizabeth Woodville and the capture of the deposed Lancastrian King, Henry VI. It is one of a number of chronicles and writings emitting from London in the early 15th centry, and it presents national political events from a London perspective.